This LoRaWAN Wireless Sensor Module is used to connect sensors in the field directly to the internet using the LoRaWAN network. The units are powered by a 3.6V Litihium battery with an livespan of approximately 3 years (depending on transmit interval). 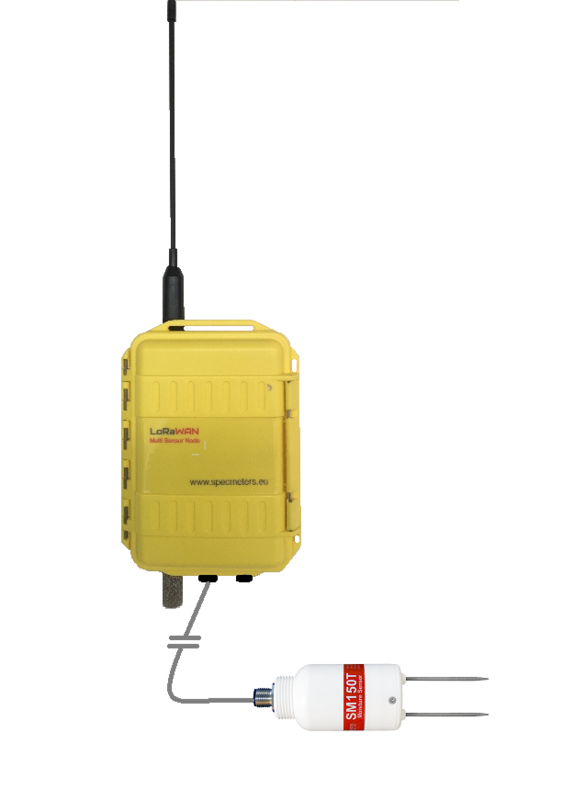 The unit can either connect to the Nation wide LoRa Network, or you can use it in colaboration with your own LoRa Gateway to set up a Private LoRaWAN Sensor Network. The LoRaWAN Wireless Sensor Module can be set to a user selectable measurement interval. The minimum interval time between readings / transmission is 5 min. Besides the SM-150-T sensor port this backplane has also two I²C sensor ports. The I²C Ports can be used to connect the Sensirion SHT3x temperature and humidity sensor, or other I²C sensors available in the market. When using the Wireless Sensor Module in combination with the Sensirion SHT3x sensor and our Tracis Software, you can use the system for Frost Alerts as well as for disease modeling. By using this versatile LoRaWAN Module in Combination with the Delta-T SM-150T Soil Moisture Sensor, you can turn this module into a powerfull wireless measuring device. Setup multiple units in your field or orchard to monitor water content in different soil types or at different depths, or get good temperature and humidity information from different locations for Frost Alerts early in the season.